RoundTheme provides themes for 3rd party Joomla extensions. 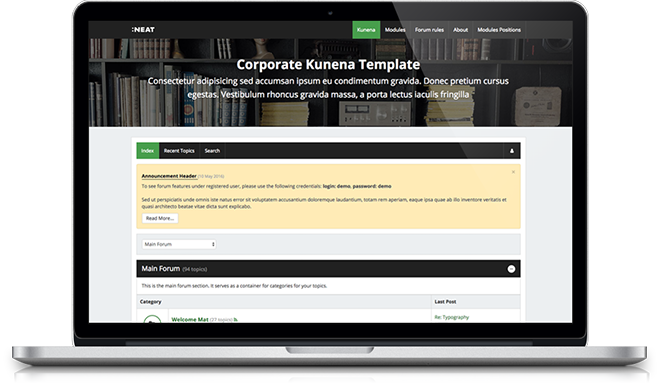 Our Kunena templates are light-weight and sleek and JComments themes are original, clean, and will be able to cover a wide variety of needs that will be able to give your website the professional look you're looking for. Customize our themes effortlessly! Pick a different font, use different colors, do whatever you feel you need to do in order to achieve what you want! Our installations will install for you a complete Joomla website that contains all the demo content you saw, as well as the styles and any extensions that already come preconfigured! You’ll be ready to roll in a matter of minutes. Your site will be displayed intuitively and beautifully on all web browsing devices due to our Joomla templates being designed as such! Join today for instant access to all our templates! We share your excitement about HTML5! That is why you’ll see that all of our Joomla templates are based completely on HTML5. All custom templates you find on our site are tailor made and hand crafted by very dedicated Joomla experts who strive only to achieve perfection with their work. You’ll never be left out in the cold or left there with unanswered questions. From detailed product documentation included with downloads, to exclusive support forums and helpful tips, we’ve got your back and we’re here to help!